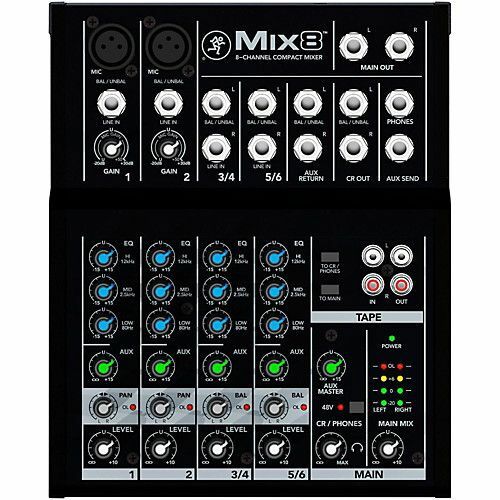 The Mix8 8-channel compact mixer is reliably rugged, with the proven quality you expect from Mackie, the world leader in compact mixer design. The Mix8 8-channel compact mixer is reliably rugged, with the proven quality you expect from Mackie, the world leader in compact mixer design. Perfect for straightforward applications with minimal input needs, Mix8 sounds great and maintains audio quality from any source. Plus, with a rugged metal chassis and high-quality components throughout, Mix8 is a solid investment in reliability. An amazing value, Mix8 is extremely easy to use and delivers the sound quality you need in a rugged design built to last. Plus, wouldn’t you rather mix on a Mackie? Don’t sacrifice – choose the Mackie Mix Series.